I imagine this as the metaphorical moment when we are poised at the top of the first hill on a roller coaster, only we have no idea that we are, in fact, about to plunge down the other side. I had some intuitive sense that this was not going to be easy. My sister had a stepdaughter and it had not looked particularly easy. What I didn’t know was that this would be the hardest thing I had ever done. My friends who are biological moms tell me that even when their child is doing the most annoying thing possible–fill in the blank here for yourself–they can still picture them when they were at their cutest and most helpless. They have that powerful bank of moments in their head to draw on–their child as a newborn, as an infant, as a toddler, with the big eyes and large head that are supposed to instinctively draw on all our deepest needs to protect and serve (the serving part taking up the bulk of the work). What do you have when you’re not a biological parent and you’re entering the picture at a considerably later phase in the game? How do you come to love a child in the way that parents love their children when you missed much of that complete helplessness and dependency? My stepdaughter and I had a good relationship from the beginning. At the start, I was her favorite grown-up friend. And then it was somewhat disappointing when I was not, but parents are not, after all, grown-up friends. I think in the beginning, I thought (quite misguidedly, I admit) that disciplining her would make me a parent. Well, it makes you no longer a grown-up friend, but not necessarily a parent, either. Maybe when she started to call for me when she needed things instead of just her dad. There were certainly days when this seemed very important to me, that she ask me to come look at and identify the red spots on some part of her body instead of her dad. I should also add at this point that I was not just step-parenting for the first time, which brings its own unique set of difficulties. I was entering into parenthood from a lifetime of singlehood and a 10 year stint living alone with only a cranky old cat and myself to take care of. In retrospect, this is a metaphorical 0 to 60 in the life change department. Single people are not more selfish by nature, but there’s very little getting in the way of them pleasing themselves and only themselves, and so a life in which you cannot lay on the couch for 12 hours watching Buffy the Vampire Slayer and eating a whole bag of potato chips in your pajamas without some serious repercussions is something of an adjustment. As my good friend says, marriage and having children is a sacrament, and what this means is that they are institutions which force you out of yourself. For both marriage and children, you must do things that all in all, you don’t really want to do. It is one of the great lessons of life and adulthood that this is actually one of the most rewarding things that can happen to you. So it’s probably impossible to identify the moment in which you actually become a parent for we non-biologicals, but perhaps it was the first time I straightened my stepdaughter’s towel in the bathroom. Being plunged into both parenting and partnerhood in one fell swoop, there was a lot of general irritation at all the control over my space which I had suddenly lost. And much consternation at all the things an eight year old is incapable of doing for herself. I don’t remember the first time I walked into the bathroom and saw her towel, which she had at least hung up after repeated admonitions, bunched over the towel rack in a kind of contorted heap which would never really successfully dry. “Should I call her back in and give a much resented lesson in how to properly hang a towel over the rack,” I thought to myself, to the extent that I was capable of any kind of thought at that point. “Or should I just straighten out the towel my damn self?” I opted for the latter, and who can say now why? Exhaustion? Resignation? Compassion? Love? In the early days of learning to parent, I remember asking my own mother, “When do they say thank you?” This was after I had thanked her for not killing me before I reached the age of 20. “You don’t do it because you want to be thanked,” she had said, and I had tried not to sneer. Does my stepdaughter ever even notice that the towel gets magically straightened? I have no idea, but the chances of being thanked for this are slim, and my mother was right. It’s not the point. 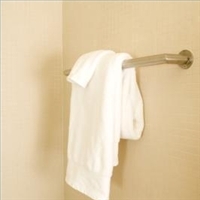 Is it important that the towel be straightened? Well, it certainly increases the chances that she actually gets a dry towel next time, but who knows if she even notices whether or not her towel is dry. It makes me feel better about the state of the bathroom and that is not something to be taken lightly. Here’s what’s really important about the straightening of the towel. It’s a small thing that I do for my stepdaughter without being asked and without being acknowledged and so it is a small act of love. And this, for me, is how you become a parent. Parenting is a constant flow of acts, some of them large and some of them small, but which all add up to the care of another human being. You become a parent by getting up at 6:30 in the morning to get your child to school, by making sure she wears her hat when it’s cold, by carrying mints in your purse for when she gets carsick, by listening to a rather long recitation of the plot of an episode of iCarly, and often by simply being there in a thousand other, fairly mundane, ways. Caring for a child in all these ways is loving a child, and this, for me, is how you become a parent. You become a parent by straightening the bathroom towel, and remembering that sometimes actually makes it a pleasurable thing to do. Robyn, that was a very moving essay. My life, too, took a non-traditional trajectory when I fell in love with a man who at the time was twice my age. He had three grown daughters, the youngest of whom was my age. Took a lot of adjustment on both sides. I was not a parent to his daughters, but I am a grandparent to his (our, as I like to think) grandchildren. And that moment you mention when you move from cool adult to an actual family member, with all of the complications that world entails–that's a painful and priceless moment. I'm so glad that you're blogging more frequently now! Thanks, Emily. I found myself a lot of times in this process wishing there were more voices telling their stories about what it's like to be part of “non-traditional” families, whatever that means in a world where most people's families don't look “traditional” anymore.